Including the already-known Bad North. Discord has shared the opening salvo of its 'First on Discord' games that'll launch exclusively, for a limited time, on its new storefront later this year. 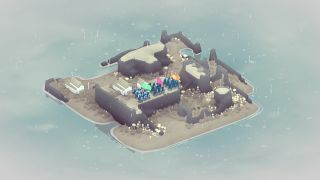 We already knew about Bad North, which I've contemplated picking up on Switch for a few months now while the wait for a PC version goes on. There are six others. First of all, there's real-time card game Minion Master (trailer here) which features co-op, and is free of charge on Discord—I'm not sure how the 'first' element applies here, since the game is in Early Access as well, but you have to pay for it on Steam. There's also third-person action game Sinner: Sacrifice for Redemption, which is launching on consoles in October, then later on PC. On a superficial level, it reminds me of a From Software game. But which one? Damn, I can't remember the name right now. Another offering is King of the Hat, a 2D multiplayer game where you use your hat as a weapon against other players—here's the trailer for that one. You can find full details of the First on Discord program here. No date has been set for the Discord storefront's release yet, but it'll be some time in the Fall.